In this post I show you how to do a total re-wire of a chandelier AND how to hang it. I found this chandelier at Habitat for Humanity for $20 that I couldn’t pass up. It was an ugly splattered green and black color but a can of spray paint could fix that up real good! 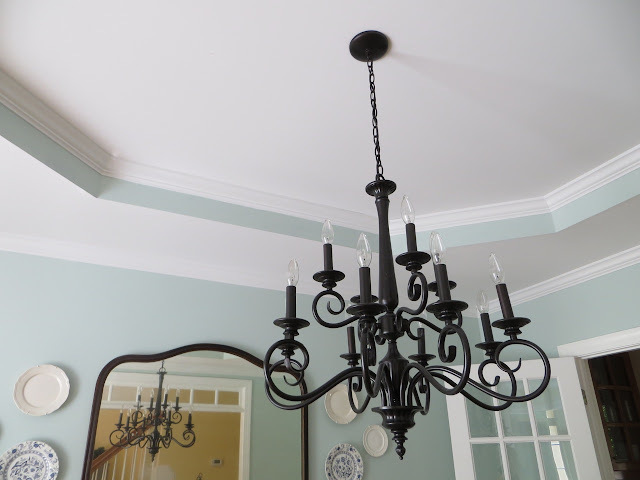 I dusted and strung the chandelier up to spray paint it Oil-Rubbed Bronze. It looked instantly better! Pleased with myself I took it inside after it had dried, climbed up on my dining table to hold it up. I probably mumbled as I realized the chain was WAY too short! How did this get passed me? Ack! 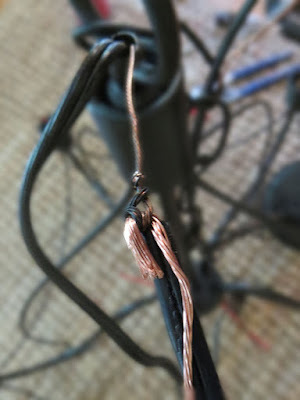 Well, I guess adding new wires and extending the chain wouldn’t be too crazy! I looked into it and all I’d need to do was pull a new main wire through the middle stem, get a longer ground wire and a metal chain! 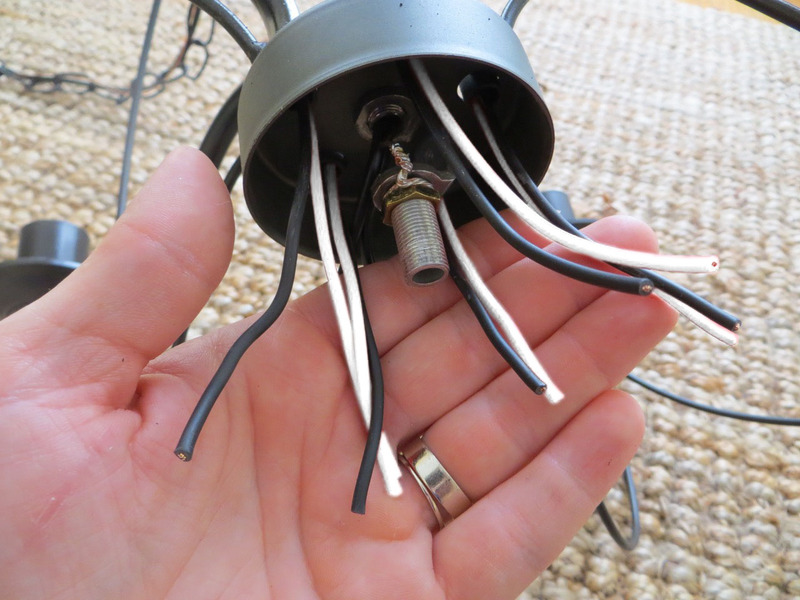 I went to Home Depot and got my supplies THEN I opened up the cap that encased the wires…. Oh boy.. it looked like someone did their own dirty work in there. See the wire cut off on the left-hand side? What IS that? 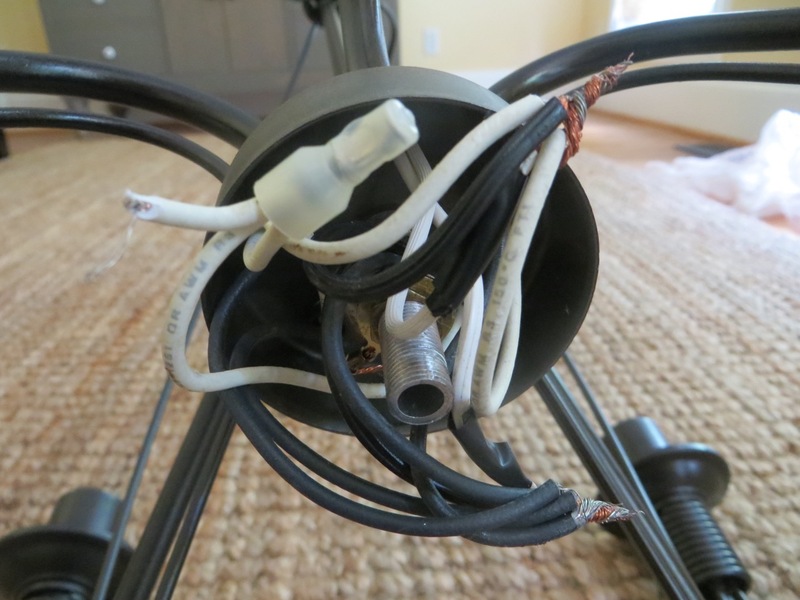 There was electrical tape marking a new set of wires someone had put in. 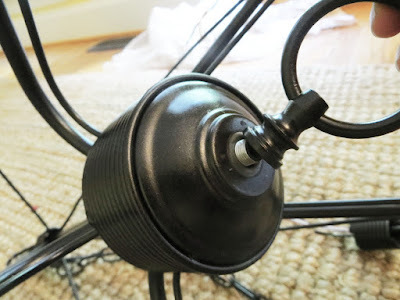 I couldn’t hang this up knowing that the wires were wonky inside soooo I set off to buy more supplies and figured this would be a great opportunity to do a post on a total re-wire of a chandelier – aren’t you lucky! 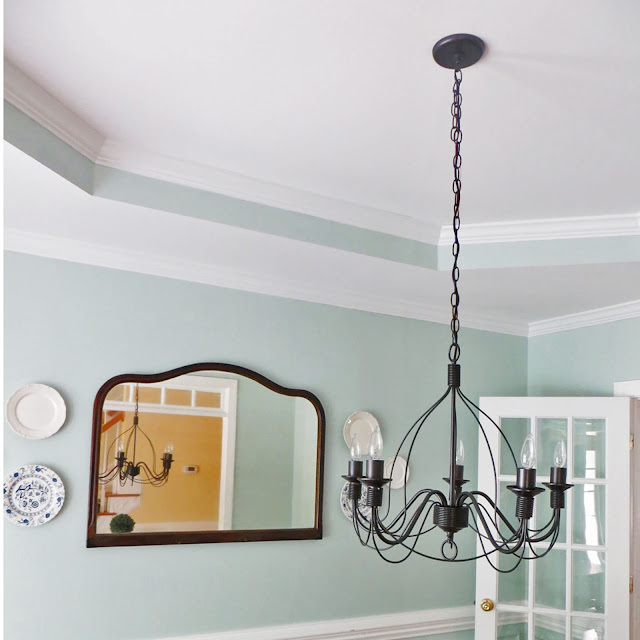 Please note: all chandeliers are different and will require you to find those differences and alter your methods and supply list from what I am showing you here. Caution: please make sure your chandelier isn’t hooked up to any power source while working on it. 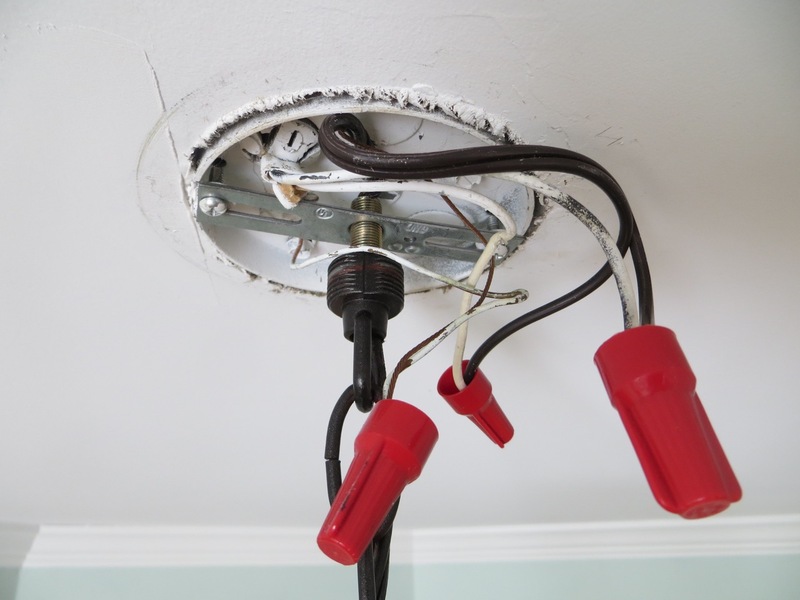 When switching out light fixtures from your ceiling check and double-check that your breaker is off. The chandelier we had put up when we first moved in had around 15 light sockets and 2 different tiers (I probably wouldn’t re-wire something this big – good luck to anyone who attempts it)! 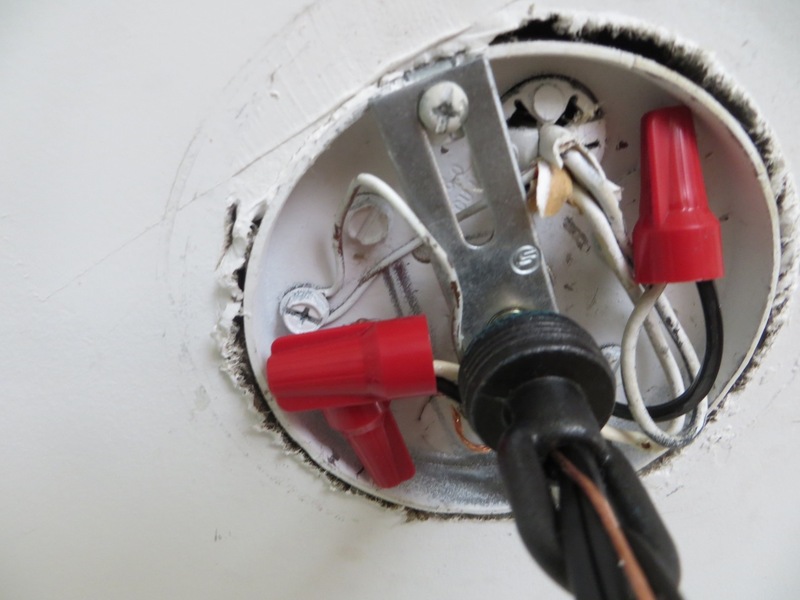 One thing to notice right from the start is what kind of sockets you’re dealing with. 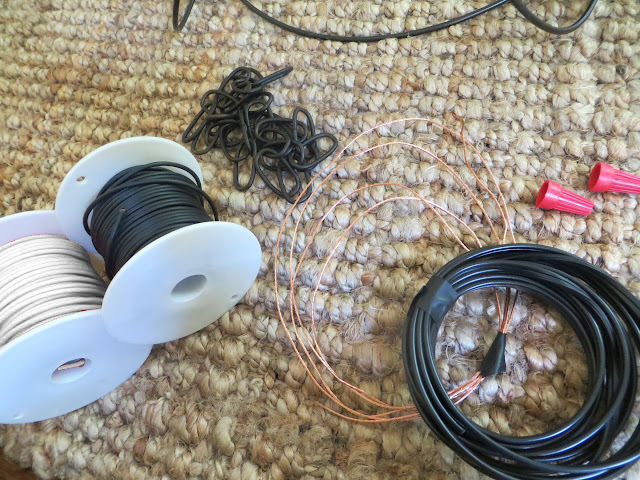 My original ones (on the left) were pre-wired and I couldn’t install new wires in them so I bought replacements (right) from Home Depot that has screws for attaching new wires. You’re sockets may be a different height – make sure you’re getting what you need. So now we know that we’re dealing with white (neutral) wires and black (power – ‘hot’) wires. 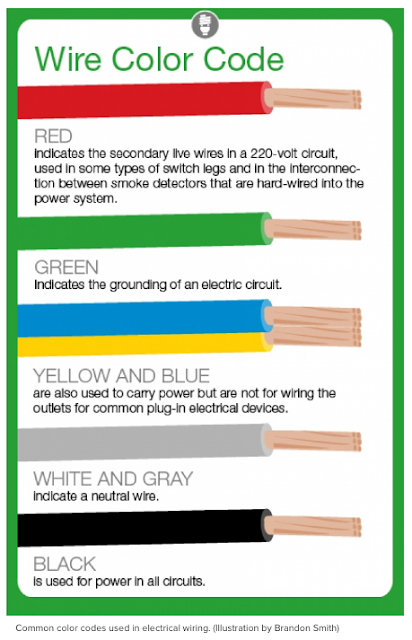 *purchase your wire several feet longer than what you think you’ll need just to be safe – it’s very inexpensive! 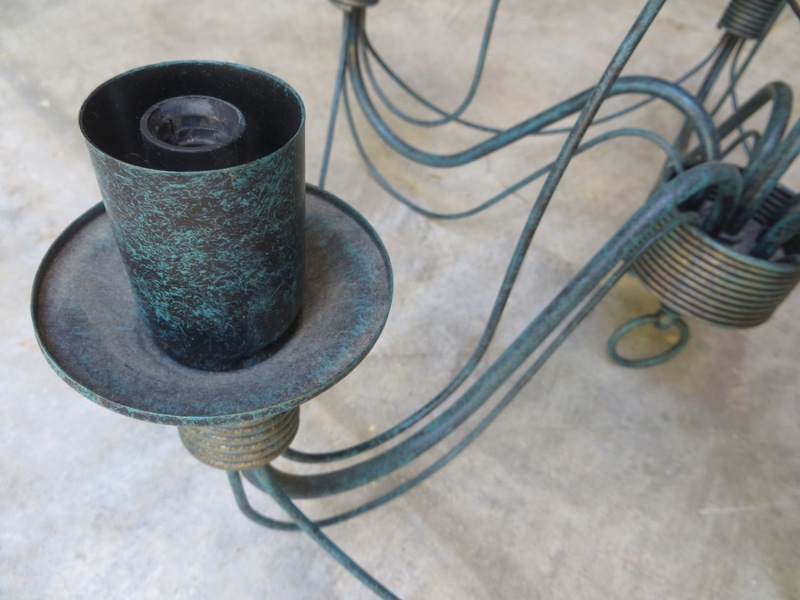 Here’s a close-up of the wires – stranded, 18 gauge. 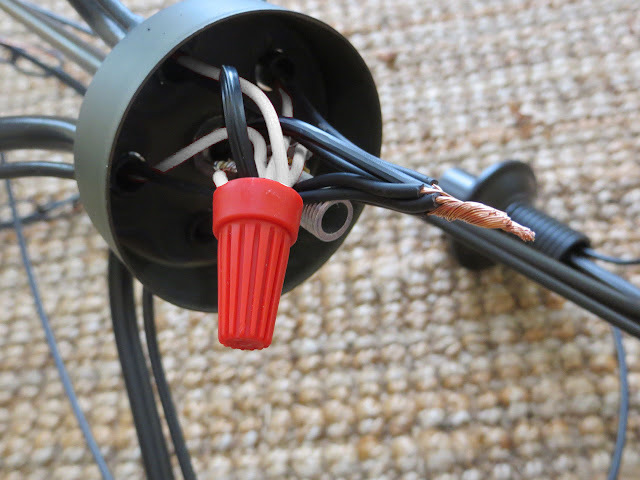 Un-screw the cap containing all your wires and take off wire-nuts. Pull all the wires apart from each other. Loosen sockets from chandelier by un-screwing. To thread your new wires through, take advantage of the old wires you will be pulling out. In the pictures I used thick fishing string tied to the bottom ends of the old and to the top ends of the new BUT you can skip the fishing string and fold the old ends over the new ends of wire (DUH, wish I would have thought of that before! However, I smartened up and did it for the main wire)! 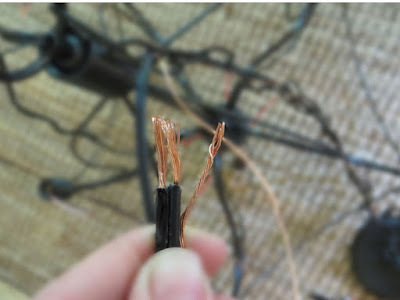 Don’t cut your new wires until instructed. TIP: to keep new wires from slipping off your string (old wires) and for them to fit in the narrow channel, strip the ends off about 3/4-inch and fold them down over your string (old wires). 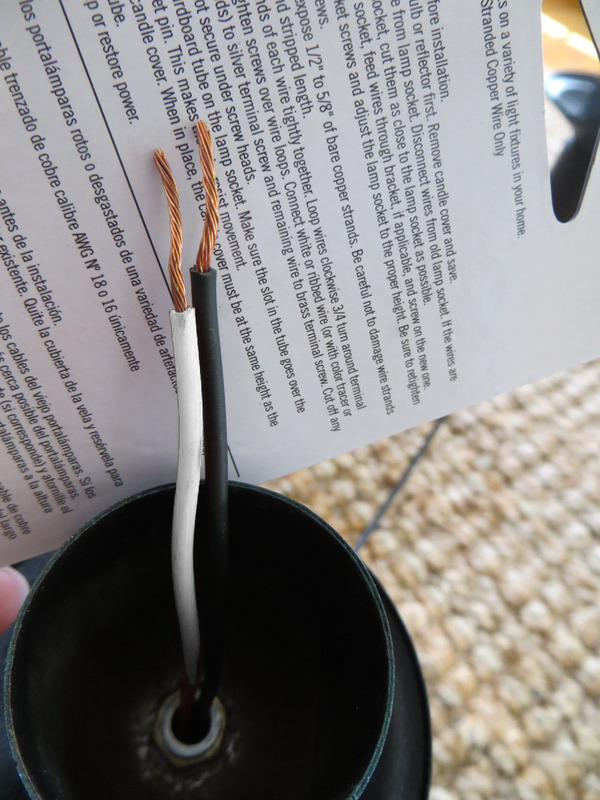 Be careful when you strip the wires because you can use these ends for wrapping around your new sockets! 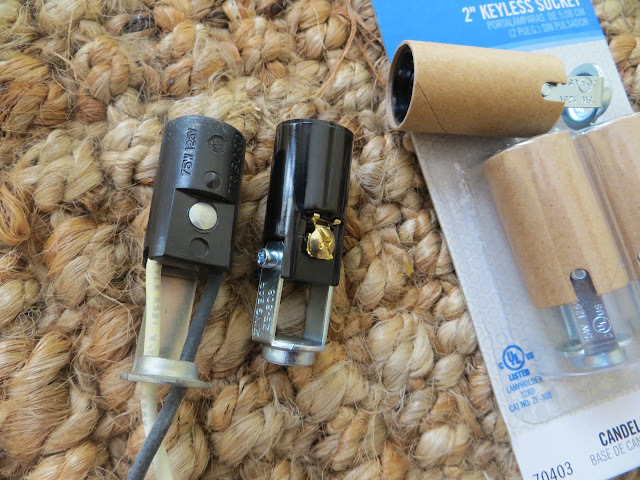 …then cut the bottom ends longer than what I thought I’d need, about 8-inches to be safe. 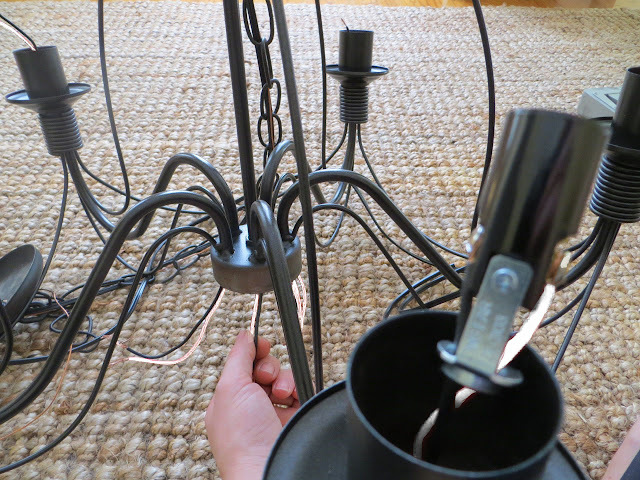 Here’s what the bottom of my chandelier looks like with all the fresh socket cords. Let’s tackle that main wire now! 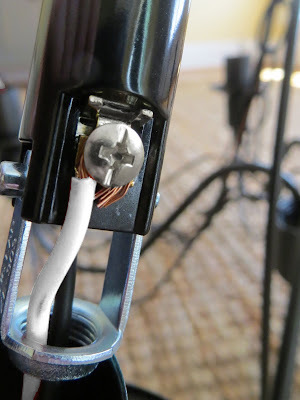 TIP: see how the ground wire has a large terminal that attaches it to the threaded rode? We’re going to make our own in a few minutes. 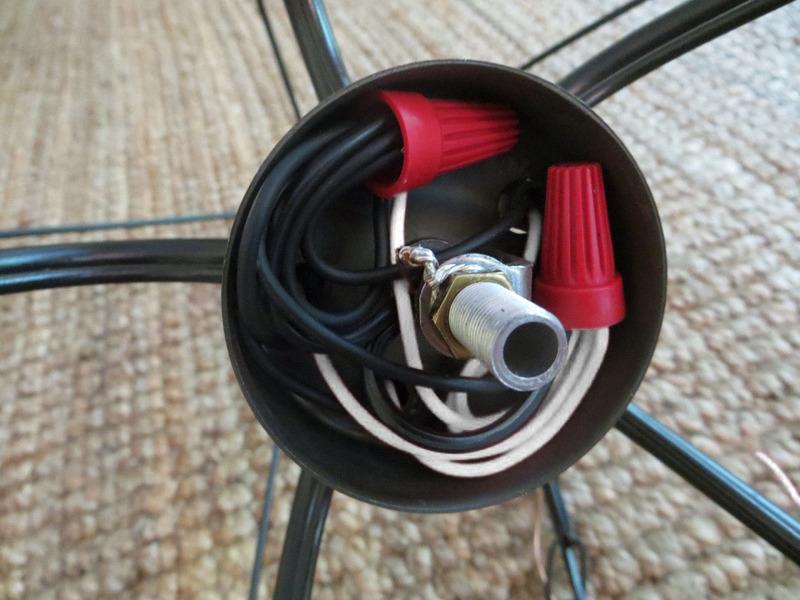 If you’re adding a new chain for length do that now. You’ll want a good grip with 2 sets of pliers to open the chain links – vise-grip pliers are the best for this! 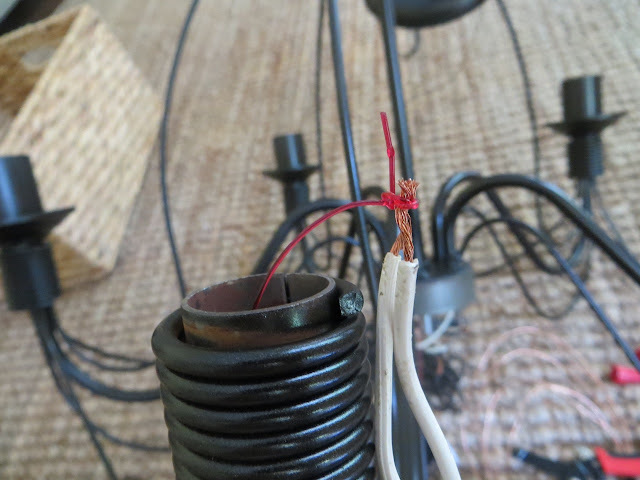 … rather than dealing with the fishing string I used the old ground wire and wrapped it around. 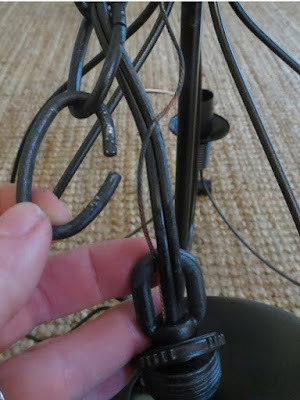 Make sure to thread your new wires in and out of every few metal chain links at the top. 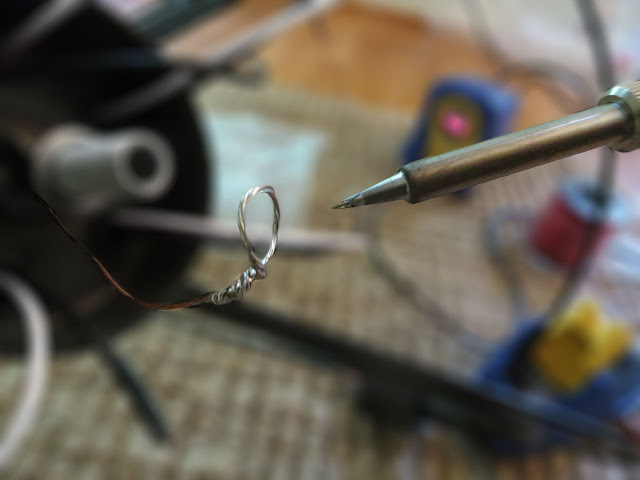 …but I went a step further and used solder and an iron to make a stronger terminal (not necessary… just an extra step). 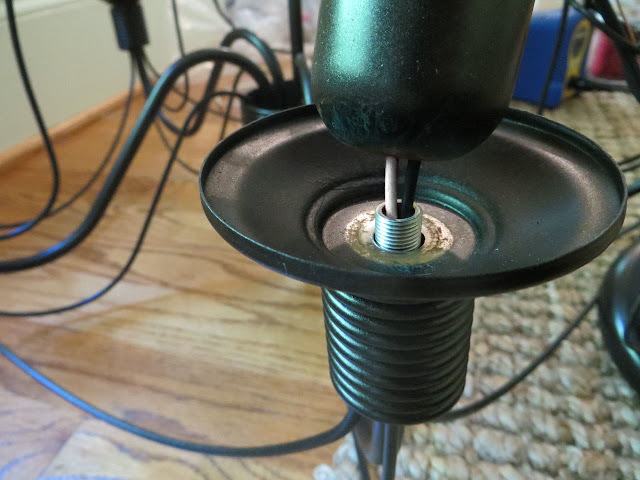 Attach the original nut over the threaded rod to secure the ground wire. 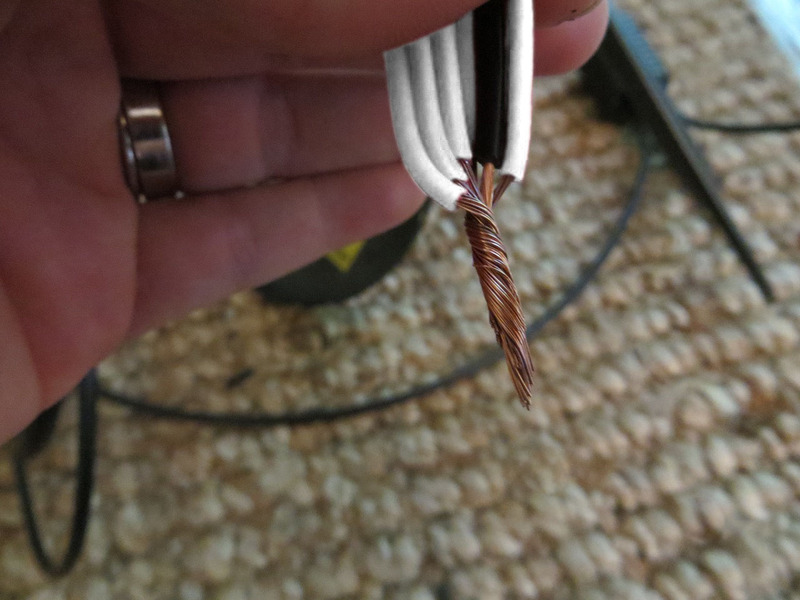 Use your Xacto knife (or other knife) to CAREFULLY cut down the middle of your main wire ends to split apart. 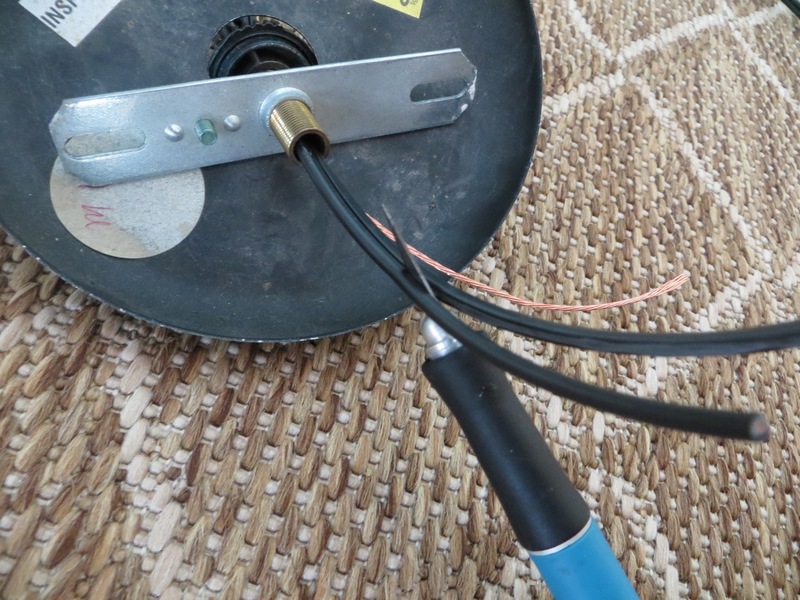 You don’t want to cut through the rubber and expose your wires! Let’s move onto the sockets for now! If your sockets are like mine, they didn’t twist off gracefully but instead un-threaded the whole rod and socket cover with them! 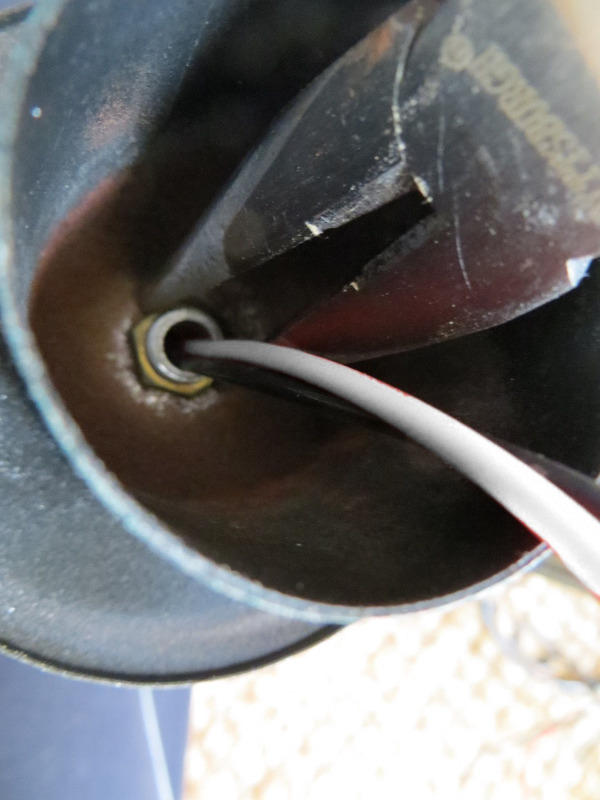 Use long-skinny pliers to ensure your threaded rod and bolt are tight before proceeding. Your ends should already be stripped 3/4-inches from the first steps, but if you need to re-cut and tidy them up do it! Twist the ends of your wires so they’re tight. 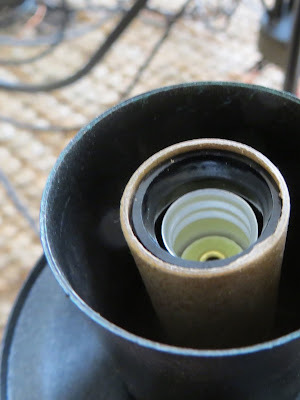 Put your ends through the base of a socket and have your white end next to your silver screw (neutral) and your black end next to your gold screw (hot). Curve your wires so they go from the left-side of your screw to the right. 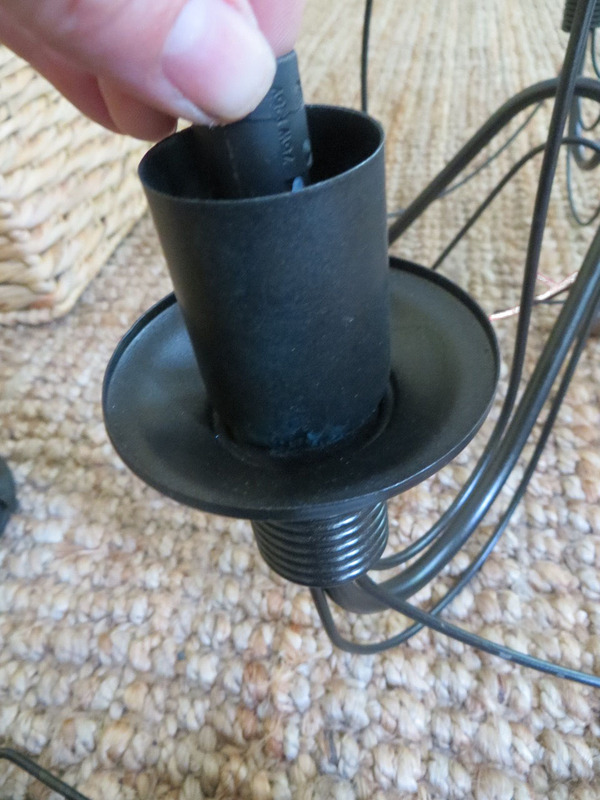 This prevents it from slipping off when you tighten. 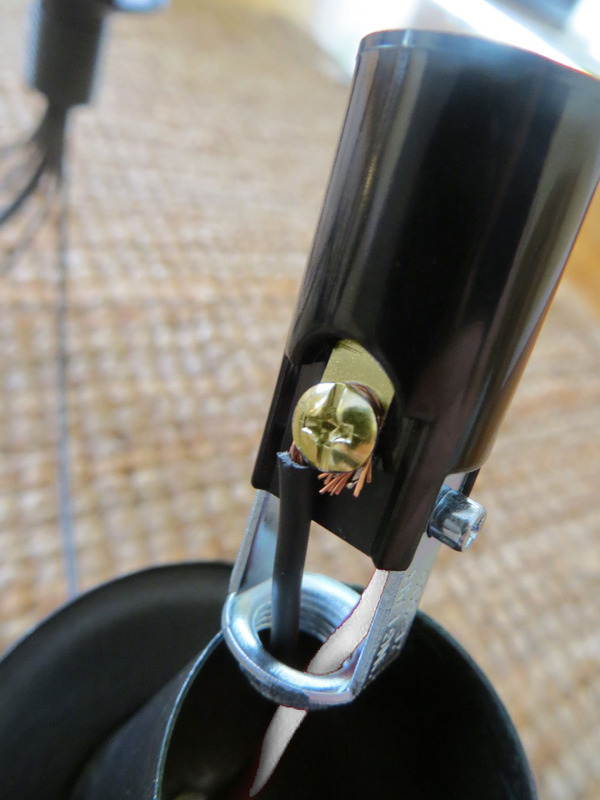 Wrap your ends around the screw – make sure the wires have good contact with the screw and that they’re not slipping out. White to silver. 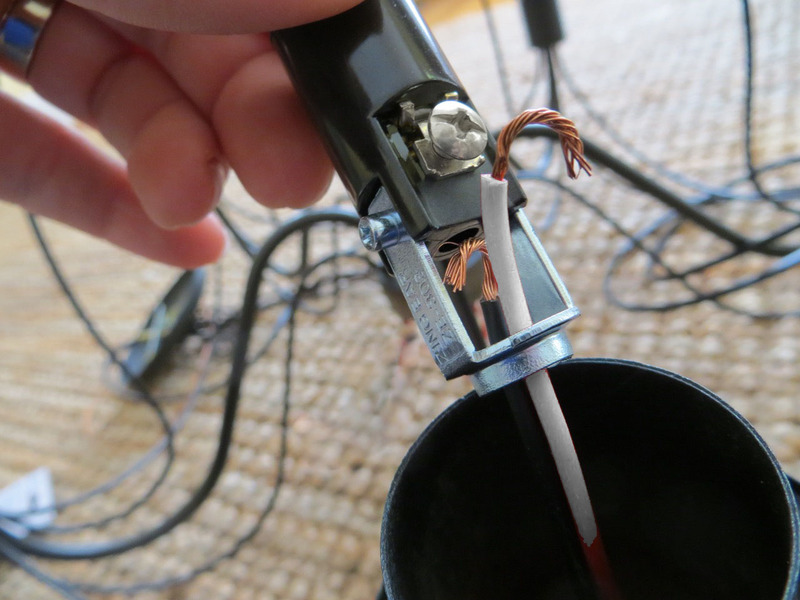 In this picture I’m showing how I’m pulling on the wires at the base with my left hand while I screw the socket in with my other. TIP: because you’ll be screwing your socket in with your wires attached it makes sense that they’d be tightly wound inside from all the turning. 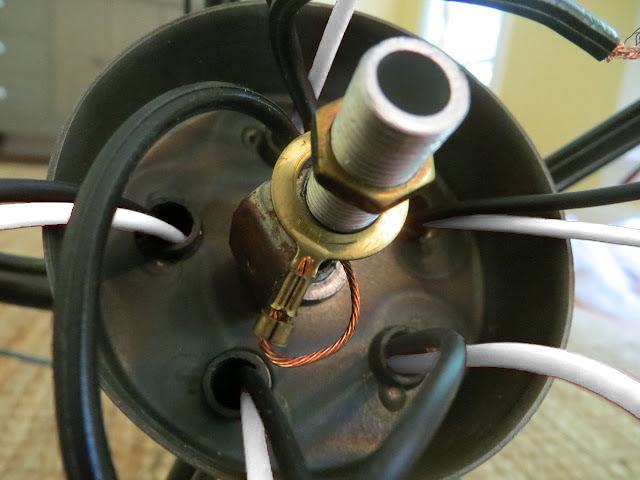 I wound my sockets up the opposite way before screwing them on so once they were screwed on the wires wouldn’t be tightly wound up inside (and possibly unscrew over time from the tension). 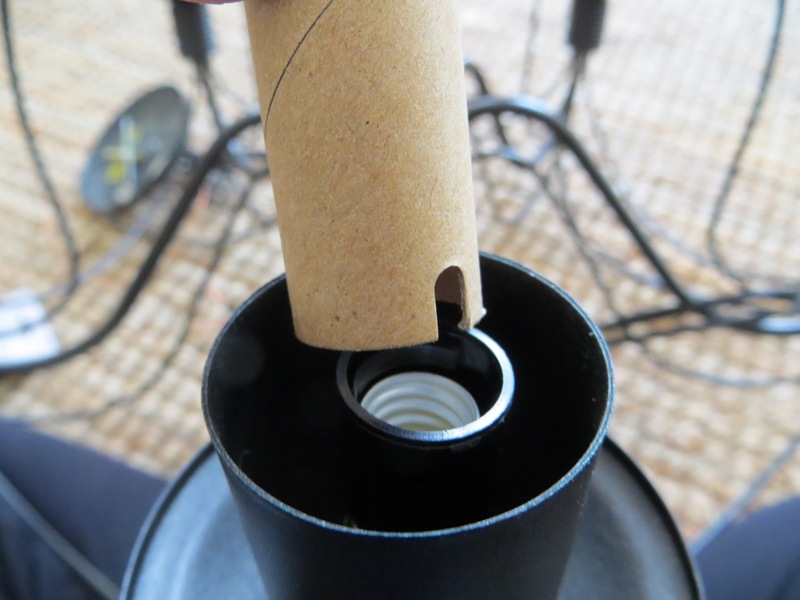 Remember to put the cardboard insulator back on! 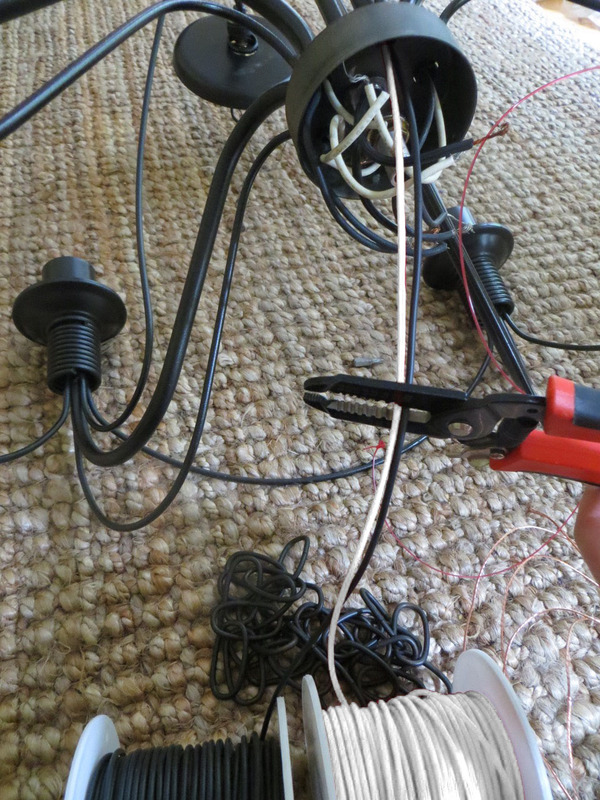 Lets tackle all those wires on the bottom now! I cut them so they were all the same length – about 4-inches. Strip the ends of all your wires to be about 1-inch. I stripped more off here than the sockets because there’s so many wires being attached together I wanted them to have a better connection together. 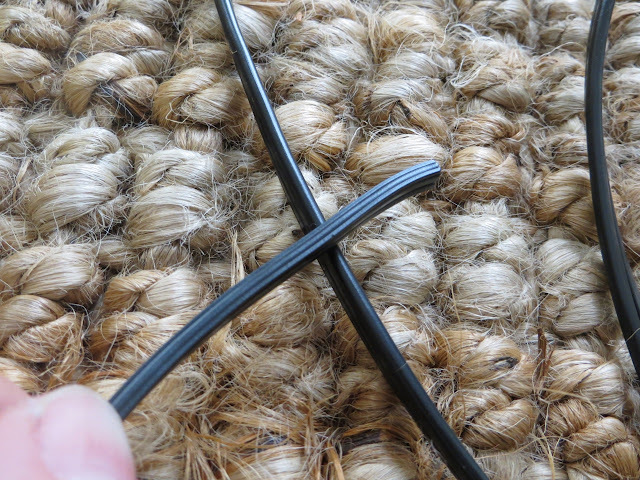 On your main wires you split apart previously you should notice one side has ribs and is more square while the other side is rounded and smooth. 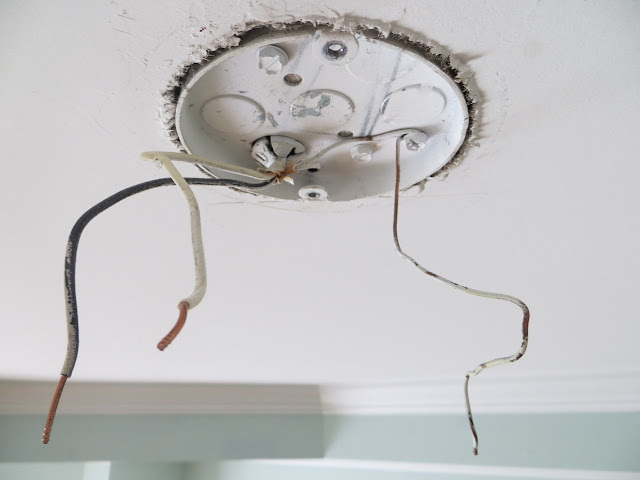 This allows you know what the neutral and hot wire is, especially when connecting to the ceiling (because they’re not color coded). 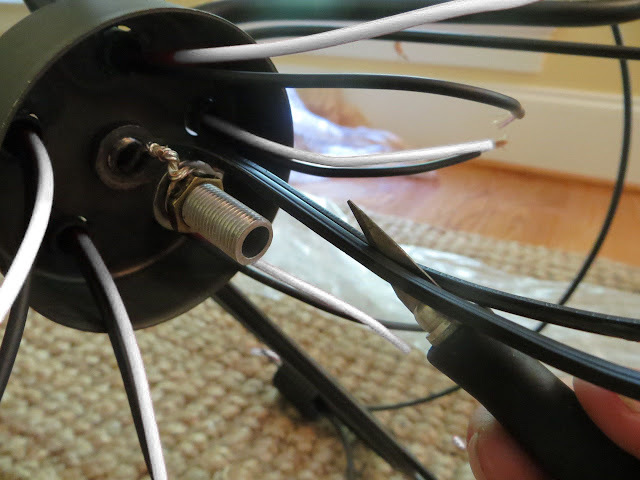 Gather all your white wires with the main wire end that has ribs. Twist all the ends together clockwise and screw a nut on the ends. 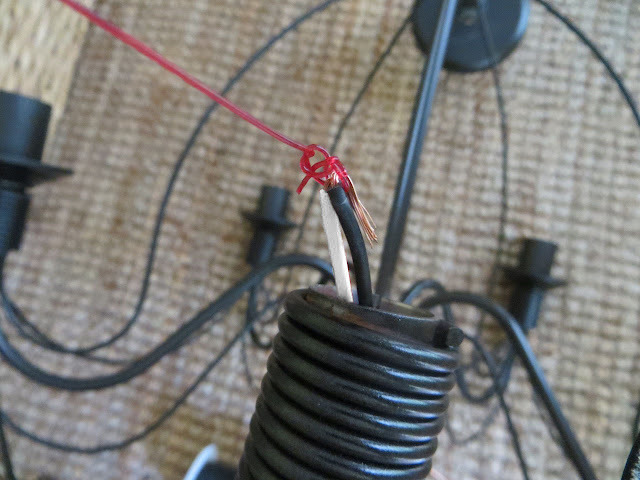 Do the same for your black wires but with the main wire that is smooth. 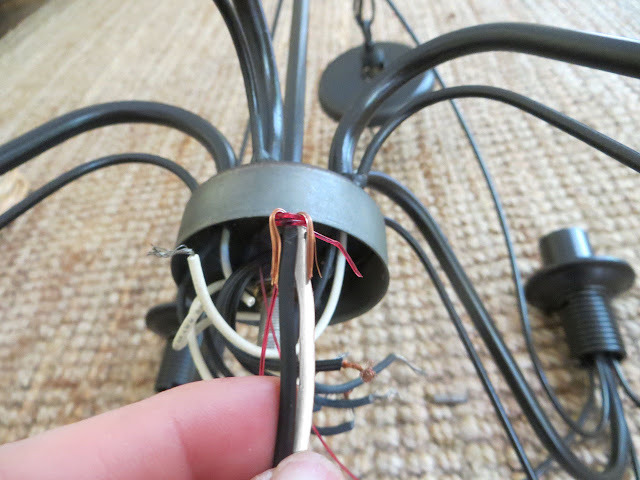 Push the wires down and screw the cover back on. Now it’s time to tackle the existing beast on the ceiling. Turn off the breaker and double-check it’s actually off! 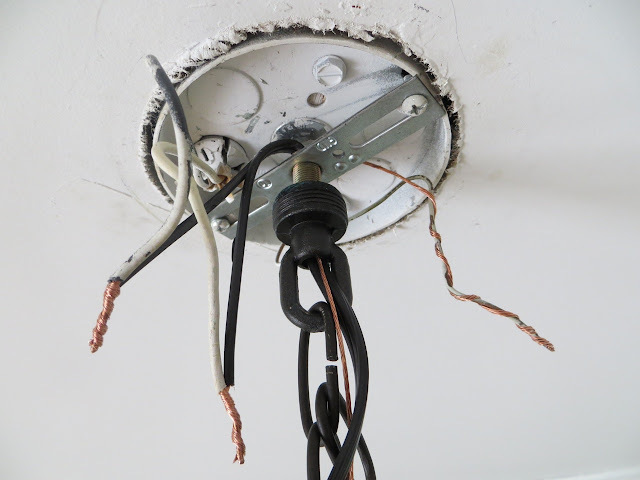 Unscrew the cover at the ceiling and pull the wires down so you can work on them. 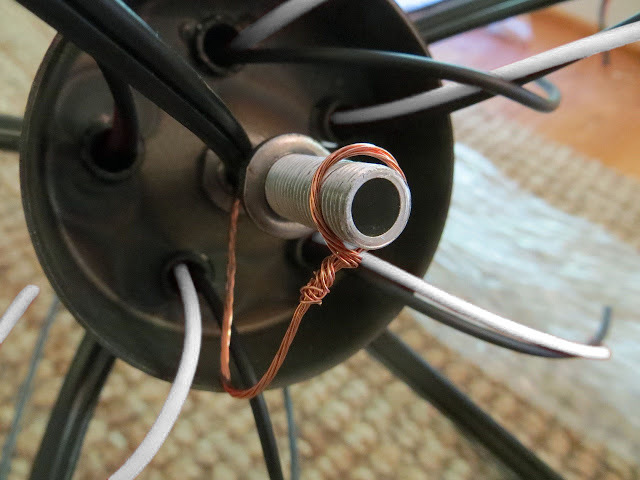 Unscrew the wire nuts and unwind the wires from each other. 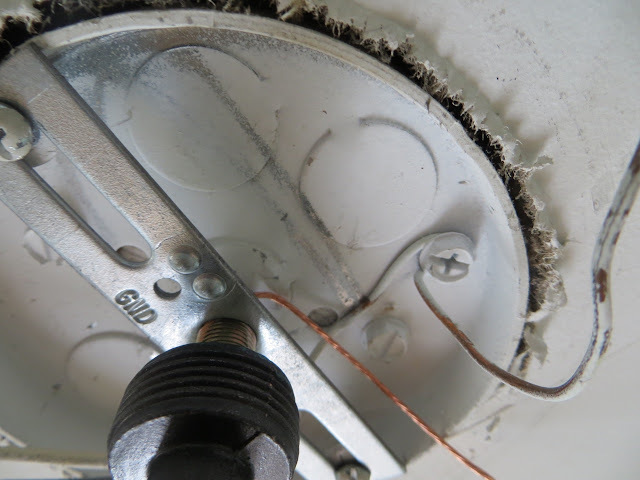 Remove the old fixture by unscrewing the whole silver bracket (easier than twisting it off by the threaded rod in the center). Make sure to pull the top of your chandelier up so it’s tight (like it’s hanging from the ceiling) so you can cut your wires to the right length at the top – about 8-inches long. 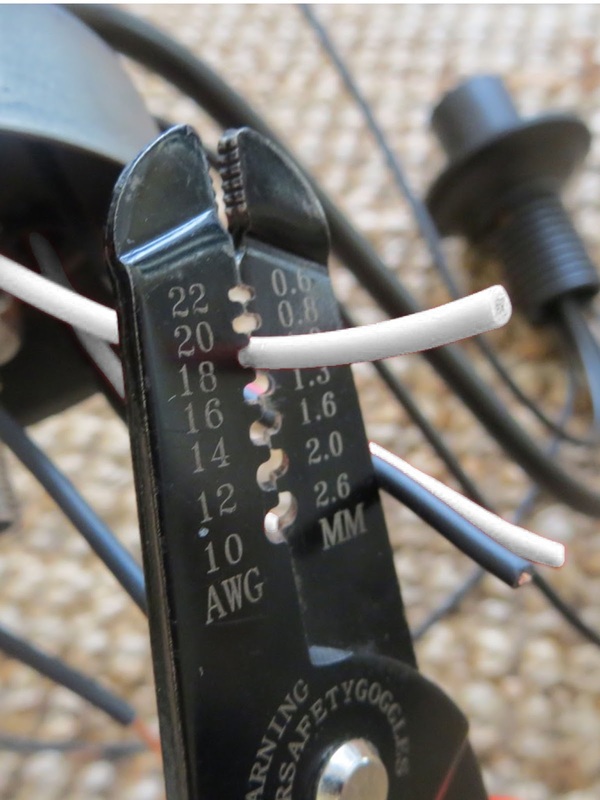 WARNING: if there’s ANY slack in your chain you can easily cut your wires too short! Cut down the center of your wire splitting it in half just like before. Strip the ends of your black wires about 1-inch long and twist the strands together. Here I’ve attached my fixture to the ceiling. It can be very awkward to hang by yourself – I just couldn’t wait for my husband to come home! You’ll notice on my silver bracket there’s a hole that says “GND” next to it. 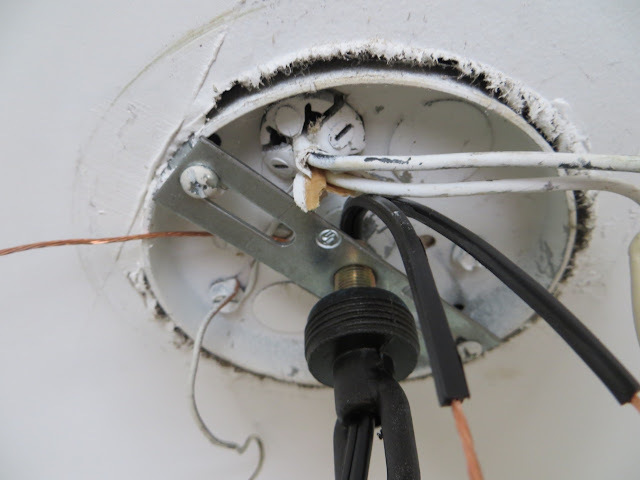 On many fixtures there is a screw there where you’d hook the ground wire to, however, my ground wire is already screwed onto the metal plate in the ceiling. 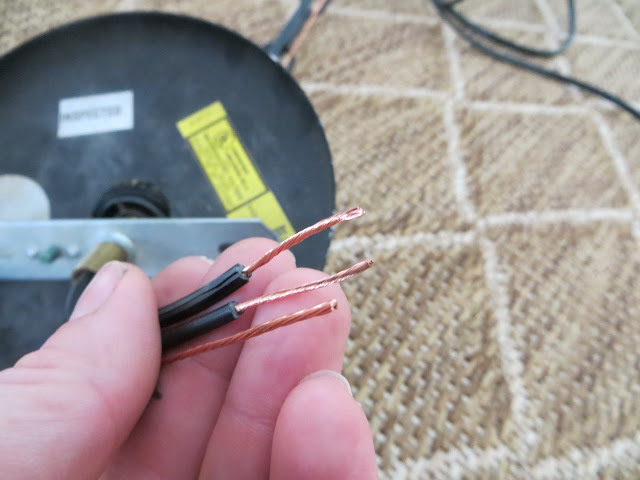 Wind your ground wire many times around the one from the ceiling to ensure good contact. 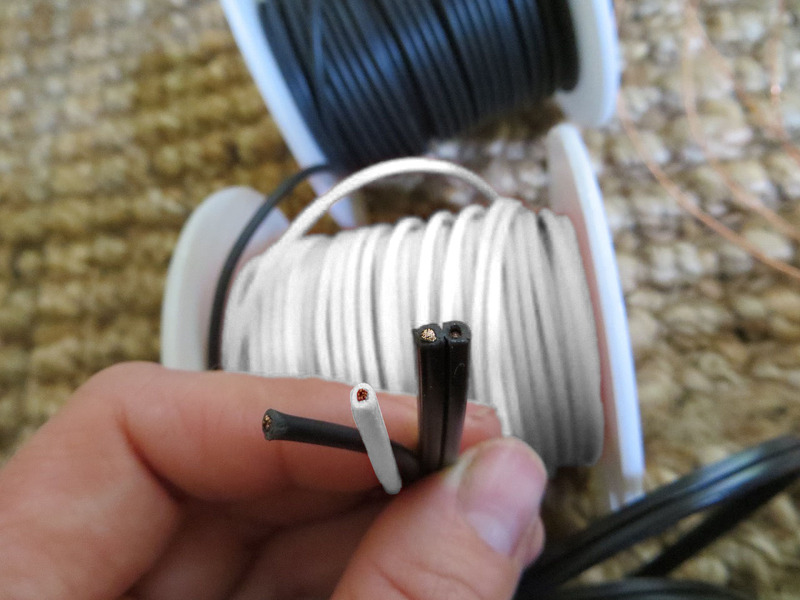 Remember your ribbed black wire is neutral and goes to WHITE and the smooth black wire is hot and goes to BLACK. Attach nuts and push cords into ceiling. Cover with cover plate and WALLAH!!! I love it so much! All the extra money and time was worth doing this project right! 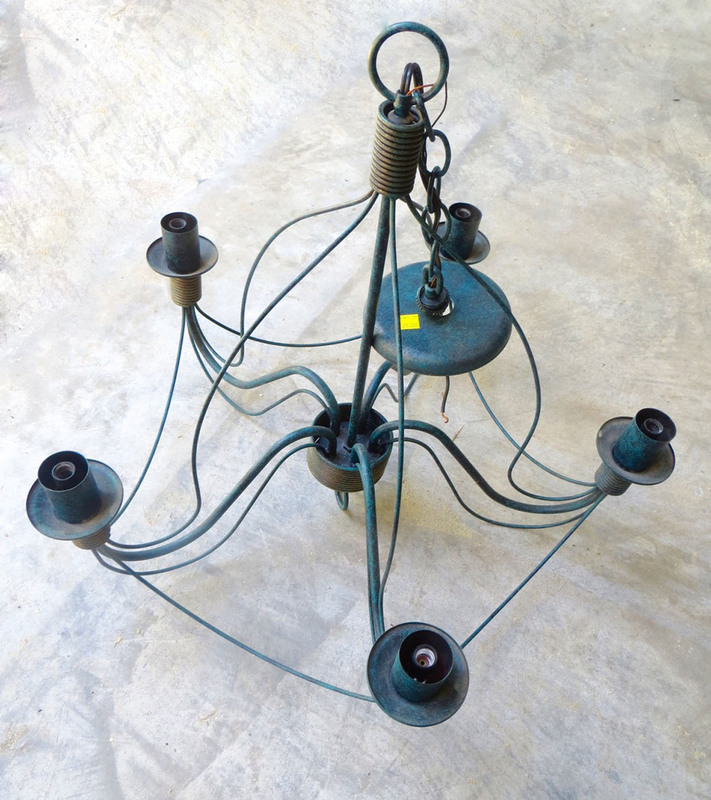 Interested in re-wring a lamp? Click here. Great job. 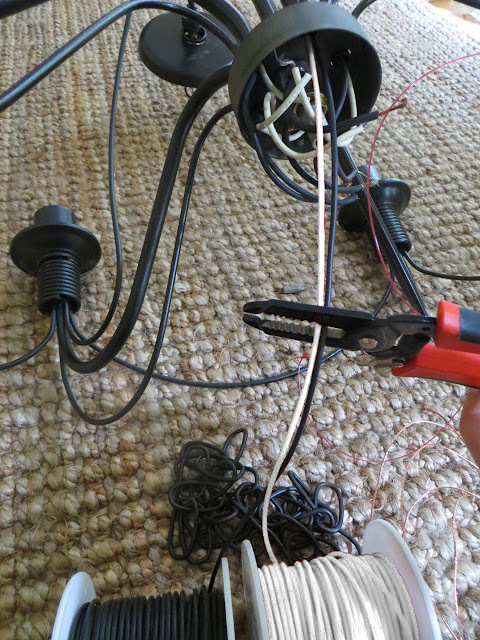 I've never rewired anything quite this complicated. Thank you for sharing.